Well, that’s certainly the case in our garden this month. A carpet of golden-yellow aconites is keeping the emerging bees bumbling around happily. I was surprised to see a reader’s letter in a garden magazine a while back berating these early flowerers for infesting his lawn. It made me smile to imagine him grumpily tearing up the cheerful little things. If you don’t like them I suppose their prolific self-seeding must be quite infuriating. We have them growing out of walls, between paving, among tree roots. I did have to sacrifice a few when I turned over the area we’re going to use for a cutting garden last week. But when Steve cut the grass yesterday, he made sure to leave a few patches here and there. Another plant that seems to get some gardeners tearing their hair out is muscari, or grape hyacinth. It spreads like wildfire. 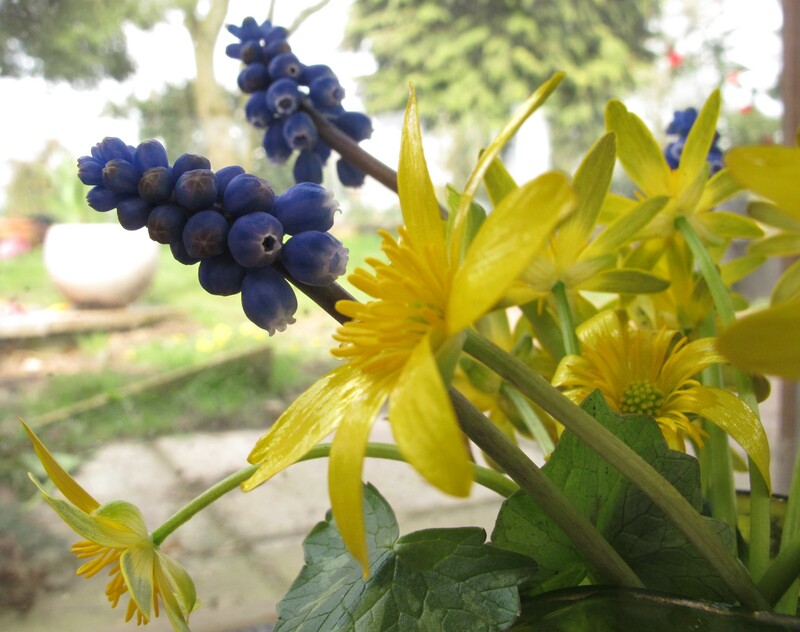 For me, any combination of blue and yellow symbolises spring. 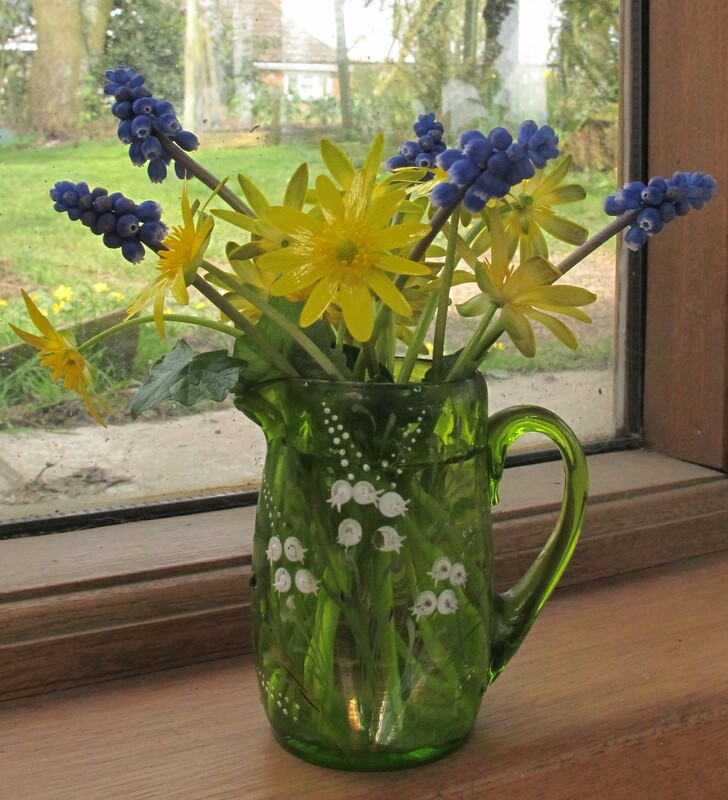 And with so many aconites and muscari to spare, I don’t feel at all guilty about picking a few for the house. There’s not much else that I’m willing to pick at the moment. We have some blossoms and early tulips, but I prefer to leave them in the garden. I decided the crocuses looked better outdoors than inside as well. 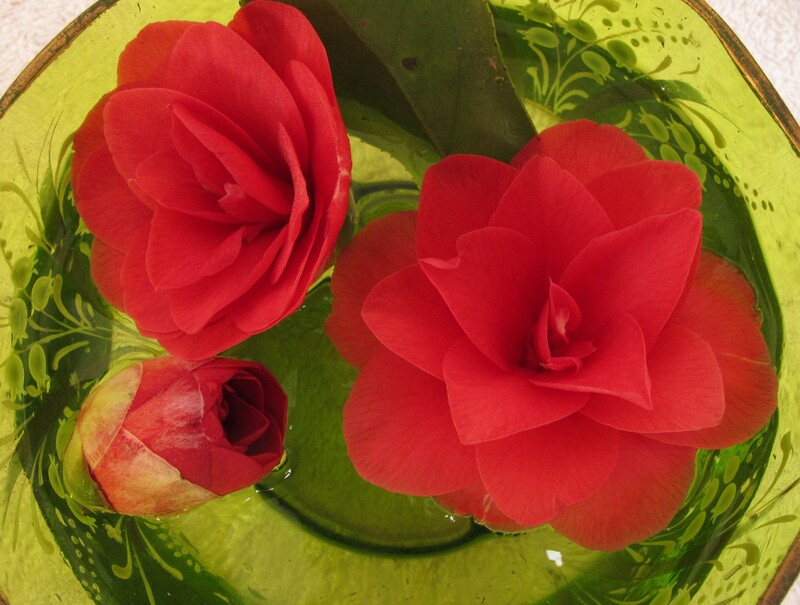 I did pinch a few blooms from Steve’s camellia though. I’m not much into floating flowers, but I made an exception for these. And it meant I could use another piece of Granny Brown’s Lily of the Valley glassware too.